This spectacular 0.67 Carat t.w. Diamond eternity band is absolutely gorgeous! 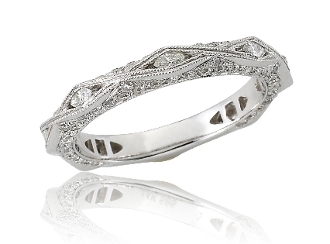 Fashioned in 14 Karat white gold, ornate milgrain beading frames marquis Diamonds in a vintage inspired criss-cross pattern along the outer band joined with pave set brilliant round cut Diamonds lining both sides. The inner band is rounded for comfort with a highly polished shank. Elegant and romantic, this shimmering Diamond eternity band is a statement piece she’s certain to adore. For added appeal personalize your item, select our Engrave option and indicate size needed when adding to Cart.